You organize a company outing or a team event? And you are looking for: ideas for a company outing? No matter what name: company outing, summer party, team event, ideas company teaming out character or corporate event. Mostly it’s about the same ideas: Having fun with colleagues while at the same time strengthening the cohesion in the company! We from AREffekt have ideas for a company outing. We are happy to organize your team event and teambuilding. Adventure, joy and success are three important elements in our company. A popular classic for the company outing is our Geocaching Adventure – a GPS scavenger hunt we organize almost everywhere. Very important are the exciting playing stations for geocaching: archery, ax throwing, the dry raft, … and many more ideas. 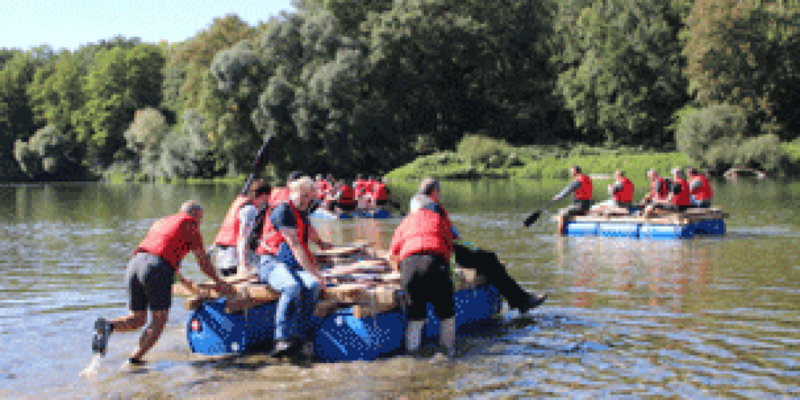 The raft ride is a great idea for the company outing. At the beginning, cohesion in raft building is strengthened and when rafting, it means enjoying the natural idyll and experiencing fellowship. Ideas company outing and teambuilding at the incredible cardboard boat regatta. A cardboard boat is created with creative ideas. Solution-oriented teambuilding with a great fun factor.